A radical departure from earlier designs, the TR7 moved away from the separate-chassis system. 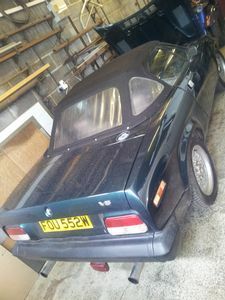 Engineered by Spen King, the car was offered initially with a 4-speed gearbox, and later with a 5-speed unit, the TR7 came first only as a fixed-head car, the drop-head following later. The engine was 1998cc 8 valve producing 105BHP in Europe and 92BHP in North America. A 16 valve 'Sprint' version was proposed But was killed off at the preproduction stage. An automotive version was offered in 1975. Although beset with production problems typical of all Leyland marques at the time, the TR7 still managed to outsell all other TR versions. 112,375 care were built, 1975 to 1981. Cars were assembled on 3 sites - Speke to 1978, Canley to 1980, then Solihull to 1981. In an effort to boost flagging sales Triumph tried all sorts of marketing ploys including the fuel-injected model, rarely seen in Europe.